Polyurethane concrete raising equipment is costly, and poly foam for concrete leveling is 4 to 5 times more expensive than mudjacking. So, why would polyurethane concrete raising be used instead of traditional mudjacking? To answer this question, four other major questions need to be asked and answered. Why would anyone spend 4 to 5 times the amount of money to have their concrete raised using polyurethane opposed to traditional mudjacking? It pays to use the more expensive polyurethane method when raising slabs that are poured over very unstable or unsuitable fill. 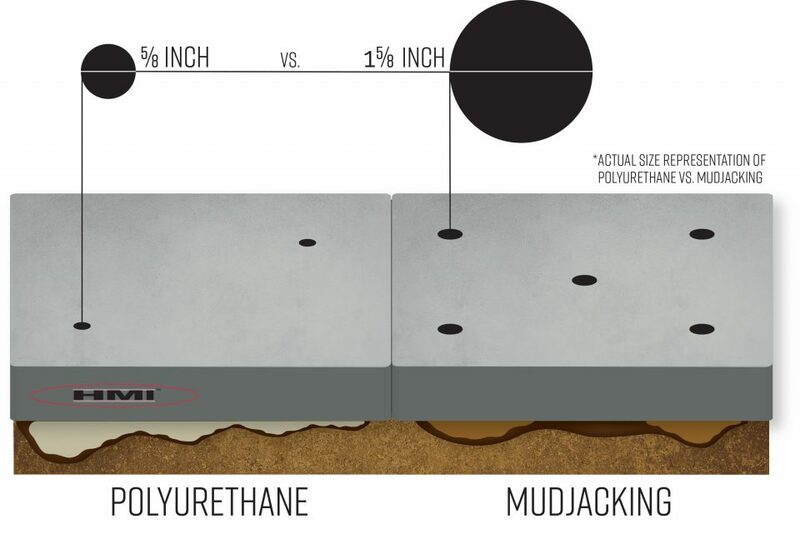 Polyurethane weighs 2-4 pounds per cubic foot compared to 100-150 pounds per cubic foot of traditional mud, making polyurethane material much less likely to overburden unstable soil. In an article written by G. L. Bowen PE. LLC, Helical Piers & Polyurethane Foaming in the April addition of Helical Pier World, Mr. Bowen discussed the advantages of using closed cell polyurethane to fill voids and support floors over peat moss soils in Alaska. In situations like this, light weight polyurethane has a tremendous advantage over much heavier mudjacking materials. Is polyurethane strong enough to raise and support concrete slabs? Traditional mudjacking does have an advantage over polyurethane when it comes to compressive strengths. A contractor can make the compressive strength of mudjacking material be whatever is desired by adding cement or combining cement with lime or sand achieving compressive strengths of 2,400 PSI. Polyurethane’s compressive strength is consistently around 80 to 100 PSI. It is preferable to pump a higher compressive strength material than the existing sub-base. Does the finished job look better than traditional mudjacking? A feature of polyurethane that will make the end results more attractive, especially to the residential market, is a smaller injection hole. Polyurethane utilizes a hole that is only 5/8” or smaller, compared to mudjacking holes that run between 1” and 2”. Who wants their concrete raised using polyurethane foam? US Departments of Transportation seem to be preferring the use of polyurethane concrete lifting for sagging bridge approaches or removing dips in highways. The main reason being the light weight characteristic of the material which will not overburden the soil. Our experience tells us that conventional mudjacking will be around for a long time. The average consumer will always look for the most inexpensive way to fix settled concrete. However, polyurethane concrete lifting has found a home and will be the solution to raising slabs when a light weight material is needed. Want to learn more about our equipment, materials, and training seminars? Click below or give us a call at 1-800-626-2464!